We all know what it’s like to finish an amazing book series, or finish watching a season finale of a killer TV show, and then ask ALL OF YOUR FRIENDS and none of them has read or seen it. But you’re dying to talk to someone about it! Anyone! What can you do? I’ll tell you what you can do. You can listen to Unspoiled! The whole idea behind Unspoiled! is that at least one of the hosts has never seen the show or read the book being covered. 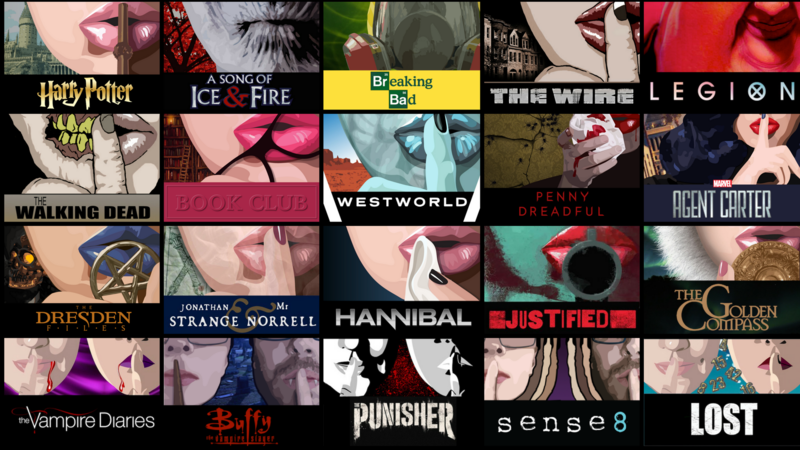 With only a few exceptions (which are Jonathan Strange & Mr. Norrell, Breaking Bad, The Walking Dead, and the first 3 seasons of Orphan Black), each podcast is hosted by one person who is spoiled and one person who is brand new to the material. Because the fun of Unspoiled! is listening to someone discover something wonderful for the first time, the spoiled host is very careful about how they lead the conversation. Certain questions or comments (we call them “implied spoilers”) can give away more than you’d think, so hosts have to be very conscious of what they thought when they were reading or viewing something for the first time and approach discussions with that mindset. It’s much harder to do than you’d think! But having patience always yields a beautiful and satisfying result when we finally reach a huge twist, reveal, or plot development. We hope that you find a show that you like in our collection, and if there’s something you’d like us to cover that we haven’t already, shoot us an email at unspoiledpodcast@gmail.com, or send us a message on our Facebook page at www.facebook.com/unspoiledpod. If you’re desperate to talk to other spoiled readers/viewers, consider joining our community by becoming a Patreon patron at patreon.com/unspoiled and jump in on one of the Facebook or Discord spoiler chats!